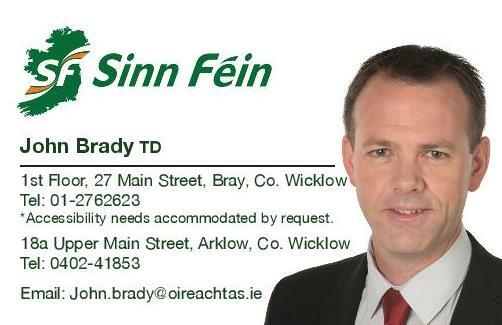 Sinn Féin TD for Wicklow and East Carlow John Brady has welcomed the passing of his party’s motion calling for the disbandment of the Strategic Communications Unit. The Dáil vote took place on Thursday and saw a defeat for the Government of 85 votes to 49. “Today, the Dáil overwhelmingly supported a Sinn Féin motion calling on the Government to disband the €5 million vanity project that is the Strategic Communications Unit. “This Unit has seen the Government spend thousands of taxpayers’ money advertising Project Ireland 2040 spending €80,000 on cinema advertisements, €75,660 on social media advertisements, and €312,498 on advertorial content in regional and national newspapers and radio stations. “Earlier this week, the Taoiseach outrageously said that he and his Government would disregard the will of the Dáil when it comes to his spin unit. Not only is this a worryingly authoritarian attitude to adopt, it demonstrates that propaganda is more important to the Taoiseach than good governance. “Practically the entire opposition has said enough to the Strategic Communications Unit and voted today for its disbandment. I am glad to see this Sinn Féin motion enjoying such wide support as it demonstrates that no party, bar Fine Gael, can abide the use of public monies to host party political roadshows and exploitation of the media.